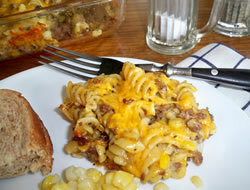 A cheesy hamburger casserole that makes a great weeknight meal. 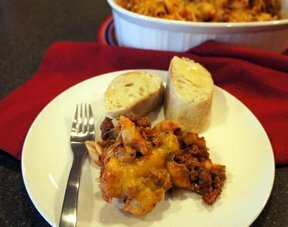 This casserole can be made up the night before and be ready to bake the next night for an easy dinner. Brown ground beef along with the dried minced onion flakes in skillet and drain grease. Prepare macaroni as directed on package. In a large bowl, mix ground beef, macaroni, soup, salt and pepper. Gently fold in corn (or peas). Spoon mixture into baking dish and top with cheese. Bake covered with foil for 1 hour at 350 degrees F. Freezes well. 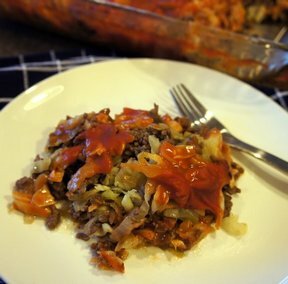 "Wonderful easy recipe using on hand ingredients. I added garlic and added a extra can of cream of mushroom soup. Yummy"
"Would have been awesome if it wasn't burned...1 hour is way to long to bake it"
"Easy to make casserole and we really liked it. Even the leftovers were good. It was nice because it make a couple of quick meals for us. I will definitely make this again."